Russia remains an enigmatic and fascinating country – much like it has done for its long, often-fraught history. And no city within its vast borders is more interesting than the port city of St. Petersburg. Quite possibly the most Western of all the major Russian cities, St. Petersburg has a long, fascinating history of revolution, rulers and rebranding (it has had three names over the course of its existence: St. Petersburg, Petrograd, Leningrad and back to St. Petersburg again). It’s too large a city to be ‘done’ in one day unlike many other cruise ports, however, you’ll find that often a stay in St. Petersburg is an overnight stop and so you’ll have longer to explore this incredible city. The port itself is situated on Vasilyevsky Island which is about 6km away from St. Petersburg’s main highlights and takes roughly 15-20 minutes to reach by car, depending on traffic. It is important to note that you need a visa to enter St. Petersburg (which costs £70 per person) or you will be refused entry. Fortunately, if you can show that you are a cruise passenger booked on a guided excursion (either privately or with the cruise line), you are granted a temporary three-day visa to see St. Petersburg. The catch? You have to stick with your guide at all times as part of your visa conditions – so no exploring on your own. Hermitage Museum: Art-lovers simply have to make their way to the world-famous Hermitage Museum in the heart of St. Petersburg – the second largest art museum in the world. Encompassing six buildings (including the Winter Palace – the former residence of Russian rulers) and with a collection of over three million items, there is some serious artistic pedigree on display, including works by Rembrandt, Picasso and Van Gogh. Church of the Saviour on Spilled Blood: If there is one sight which Russia is most commonly associated with, it would be the multi-coloured onion domes which adorn their magnificent churches. And St. Petersburg is no different, with its iconic Church of the Saviour on Spilled Blood visited by thousands of tourists every day. The exterior is traditional Russian baroque architecture of the highest order, but it’s still well worth heading inside to see the intricate mosaics and paintings. Saint Isaac’s Cathedral: Get a decent vantage over the city of St. Petersburg and chances are you’ll notice a gleaming golden dome towering above all else. This belongs to Saint Isaac’s Cathedral – the largest cathedral in St. Petersburg and the fourth largest in the world. Its exterior is an imposing spectacle framed by giant red granite columns, while its interiors are an exercise in excess with an amount of gold-plating that even Donald Trump would think is too much. Climb to the top of the dome for an incredible view of the city. Café Idiot: Named after Dostoevsky’s famous novel, The Idiot, this St. Petersburg favourite sells a wide selection of Russian classics (mostly vegetarian). Teplo: This popular restaurant is perfect for lunch or dinner and serves a range of local favourites and exotic cuts of meat. Try the Uruguayan beef. Restoran: Located in a plum spot near to the famous Palace Bridge, this is haute Russian cuisine for those happy to splurge a few roubles. Nevsky Prospekt: Everything important in St. Petersburg runs through this main shopping street lined with brilliant cafes, shops and restaurants. Gostiny Dvor: St. Petersburg’s oldest shopping centre (it dates back to 1785) is a paradise for history-lovers and shopaholics alike. Church on Spilled Blood Street Market: There’s often a pop-up flea market lining the street in the approach to Spilled Blood, perfect for a tacky Russian doll souvenir. Don’t leave getting your Russian visa until the last minute. Not only will the price go up but you need to allow yourself roughly eight weeks before travel to guarantee your visa will be approved. 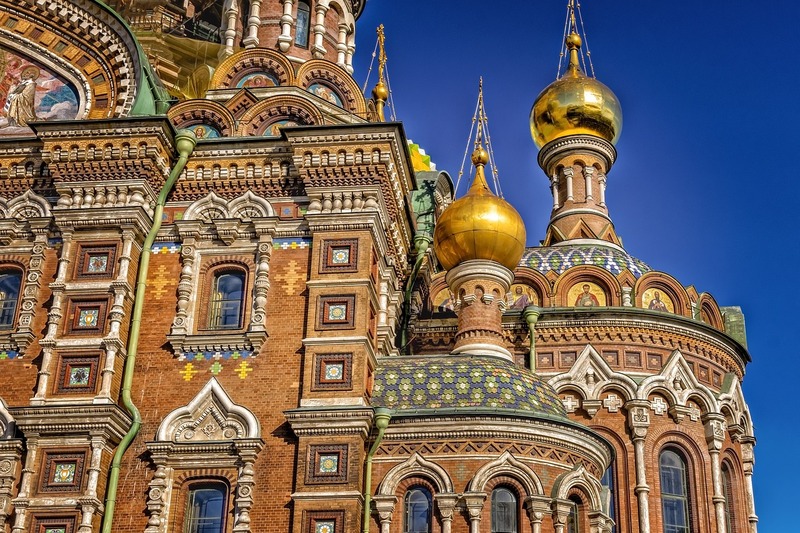 If you are planning a trip to St Petersburg then you may also be interested in checking out the latest ocean and river cruise news and our most recent cultural cruise features.